There's a simple reason Melinda Gates has dedicated her work to the worldwide well-being of women and girls. A mother's education, she says, can mean the difference between life and death. It can be the difference between buying candles for a 5-year-old's birthday cake and digging a grave for that same child. "That's actually why we say poverty is sexist," the philanthropist and businesswoman told CNN's Poppy Harlow in an interview. There are more women than men in vulnerable circumstances worldwide, Gates said. Yet women are often the ones who make crucial decisions for their households, like managing a budget and deciding who goes to school. "If we don't invest in her," Gates said, "then she can't lift everybody else up -- and yet she wants to." To make those investments, Gates said she has to know more about the challenges facing women around the world. Data on women's labor practices and income levels are often thin or nonexistent. She wants to change that. The Bill & Melinda Gates Foundation, which Gates runs with her husband, Microsoft founder Bill Gates, pledged $80 million earlier this year to gather data on labor practices, wages and other metrics that focus on women. She noted that in the United States, women do 90 minutes more unpaid work per day, and are often in charge of making sure homework gets done and lunch boxes are filled. In her own house, she said, she realized at one point that she was expecting her son to take out the trash and her daughters to unload the dishwasher. So they mixed up the family chores to set a simple example. And when their oldest daughter, now 20, was in preschool, Bill Gates — still in charge of Microsoft and one of the richest people in the world — shared the work of dropping her off for the day. "It was kind of a scuttlebutt in the classroom amongst the moms," she said. "I said, well, what's going on? They said, we're all going home and telling our husbands if Bill Gates, CEO, can drive his kids, so can you. We were role-modeling for other families, and sure enough, more dads started showing up at school, and it was great." For Melinda Gates, her focus on women and girls sharpened two years ago, when she turned 50 and started thinking more about her legacy. "It was about: How to do I want to change the world?" she said. "How do I want to leave things when I'm gone?" That includes alleviating poverty, not just abroad but in the United States.The most recent U.S. census data showed 14.2% of women ages 18 to 64 were living in poverty, compared with 10.5% of men in that age range. Gates said many poor women in the United States are single mothers struggling to make ends meet. She suggested focusing on the roots of those problems, and figuring out how key players in philanthropy and the public and private sectors can help. "I have to do this work. I want to do this work," Gates said. "It's the thing we have to solve if you want to increase the GDP around the world -- if you want to transform societies." 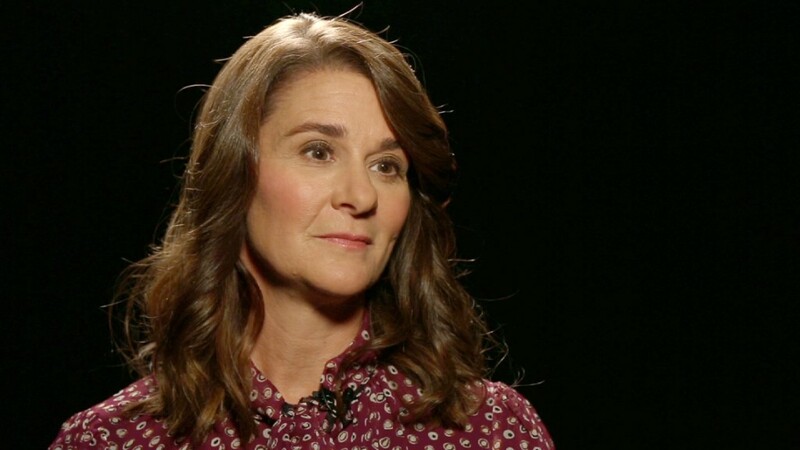 The full interview with Melinda Gates will air Saturday in the 5 p.m. ET hour of CNN Newsroom with Poppy Harlow.